From the Netherlands, Pit works as booking officer for Wicked Diving. 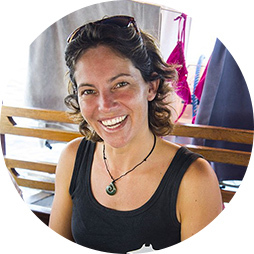 She previously worked on liveaboards as dive instructor in Thailand, Komodo and Raja Ampat for Wicked Diving before moving to Bali to serve as one of the bookings officers. She was inspired to travel and work in the travel industry by her aunt who had traveled a lot as a young woman. After finishing high school, she set out to venture through Thailand, Indonesia and parts of Africa for 8 months. Many years later, after finishing her studies in Amsterdam, she went on a holiday to Egypt and ended up becoming a dive instructor. It was an ideal job for her, diving, teaching, being outside and active every day and meeting lots of different people. Indonesia is her favorite destination, naturally — both under water and on land! of course! In addition, Africa (especially Namibia) also maintains a very special place in her heart. She’s most passionate about diving, her husband, their three-month old son and their dog, Simba.